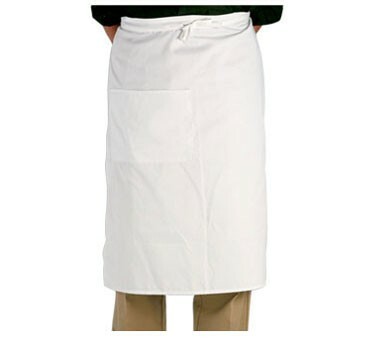 Use the Crestware BW White Two-Pocket Bistro Apron to protect your staff's clothes from food stains. This bistro apron features a classic look that will add a professional touch to your restaurant or other food service establishment. Featuring a poly/cotton twill blend fabric, this bistro apron is comfortable to use and easy to maintain. This apron is equipped with 2 pockets for food order forms, recipes and other restaurant necessities. Functional and economical, this two-pocket bistro is a must have for any professional kitchen.